eZ Enterprise provides advanced editorial capabilities such as in-page editing, creation of block-based Pages, editorial workflow, etc. To access the Back Office (the editor interface), add /admin to this address. For example, if your website's URL is www.my-site.com, you enter the editing interface through www.my-site.com/admin. 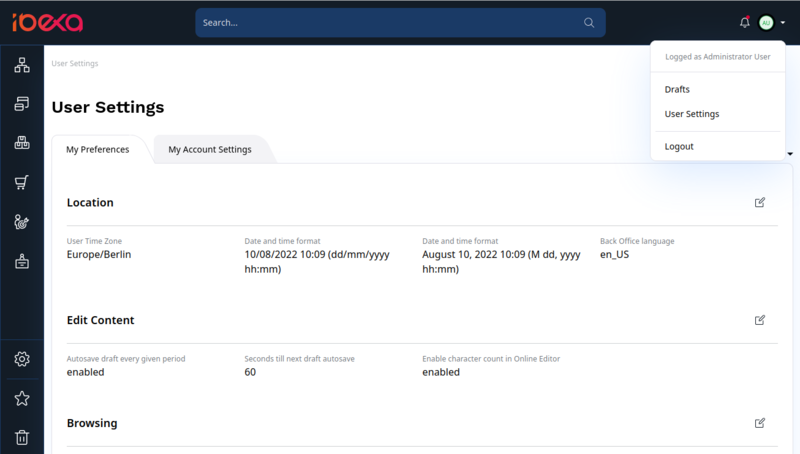 The first screen after logging in is the Dashboard. It contains shortcuts to most commonly used content: review queue, your drafts, the content you have created, recently modified content, etc. You can select any of these items and view them in detail or start editing them from this point. Page enables you to create and edit block-based Pages. It is only available for eZ Enterprise users. Forms enables you to place a survey, questionnaire, sign-up form, etc. on your website. It is only available for eZ Enterprise users. Here you can change your user password and define your user preferences, such as preferred timezone, date and time format, or Back Office language.